I received this Box Complimentary from Influenster to try&review which I was really excited about receiving. The FormulaX System Xcel Is a 4 Step Process.It comes with a Cleanse,Prime&Shine,along with a featured FormulaX Color “TGIF”.It’s a pretty pinkish coral like color that needs about 2coats.The 1st coat came out a bit streaky,2nd coat helped smooth it out. The Gloss is the 4th Step & It does add a nice shine to the polish. I applied the System Xcel to My Acrylic Nails.Its Supposed yo last for 10days of wear. I removed It on about day5 because i change my polish frequently.I didnt have any Polish Chipping&It Didn’t turn dull.Also Polish does tend to last longer on Acrylic Nails than on Natural Nails So different results may occur. The 5 Finger Delete All is a Acetone Polish Remover and its Ahmazing!! It claims to work within Seconds & it actually does just that. I had 2coats of Glitter on for accent nails& 2coats of a shimmery cream polish on the others.It removed the Polish&Glitter from all 5 of my nails at the same time in about 12seconds,With No mess.I had a tiny bit of Glitter left on 1 thumb nail but that only took 1 more quick dip to remove. The Holes that your fingers go into is a Sponge so they fit comfortably. This Polish Remover is for sure a Game Changer.Compared to the time it takes to remove Glitter& the mess it makes using regular remover,This is definitely a product I would recommend and one I’d keep using. I hear this Pink Gel Coat works really good&That Helps your Natural Nails Grow out within a couple weeks.It also helps with Splitting,Short,Brittle Nails.I can’t wait to put it to the test because mine do all of the above! I will be taking before&after pics of my results and posting an update. This Perfect Formula is made to Brighten Your Nails&Bring out the Natural Color in your Nail Bed. It also Has Keratin to Strengthen & help your Nails Grow long,Strong &Its 3Free.Which means it doesn’t have alot of harsh chemicals in it that comes in most nail polish. http://www.sephora.com/perfect-formula They also sell on QVC. I Luv Me Some Mickey Mouse!I wore this design at least a week. I couldn’t wait to use my Mickey stuff & This Polish so I slapped it all together lol. IdK How I ended up on a Page w/Polish but I was on Forever21 looking for Tshirts.I didn’t even know they sold polish. Next thing i know i Ended up ordering a few that were on Sale for under $3.They Even had Models Own &I ordered a scented 1 for 6or 7 Bucks. F21 Brand didnt have Polish Names(Names is 1of my fav things about polish) The 1 I used Just says Light Blue.I call it a Crelly cus of the thickness & The Glitter.Its an ok formula,It dried quick.I had to use 2-3 coats but didn’t have to fish out the glitter. 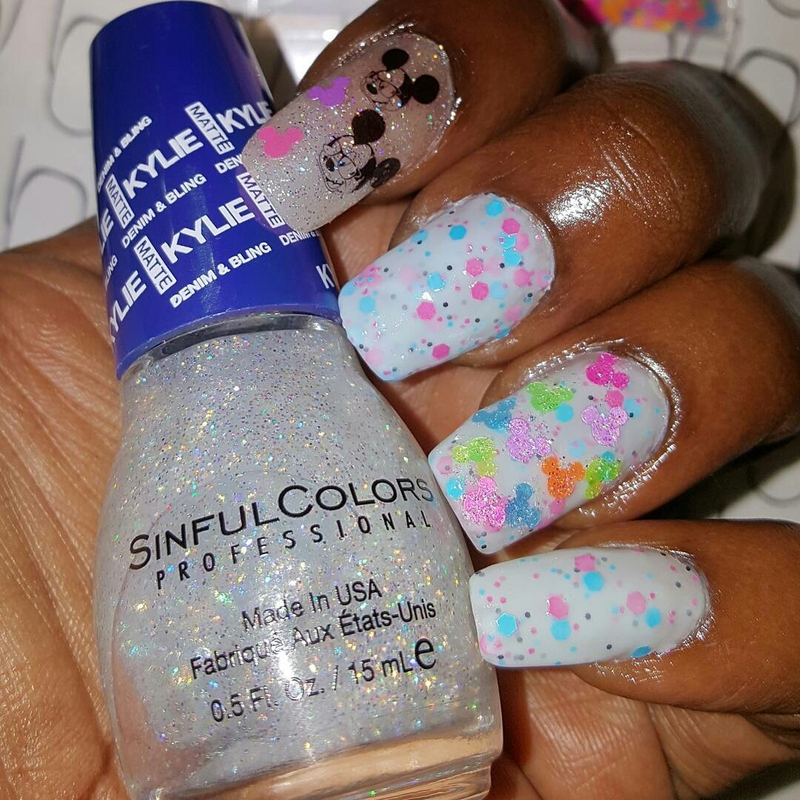 On my Accent Nail I used SinfulColors KONFECTION Kylie Denim Matte &The Mickey Heads Are Glitter Pieces that can be mixed in Polish&Acrylic(Info Below on where to order). 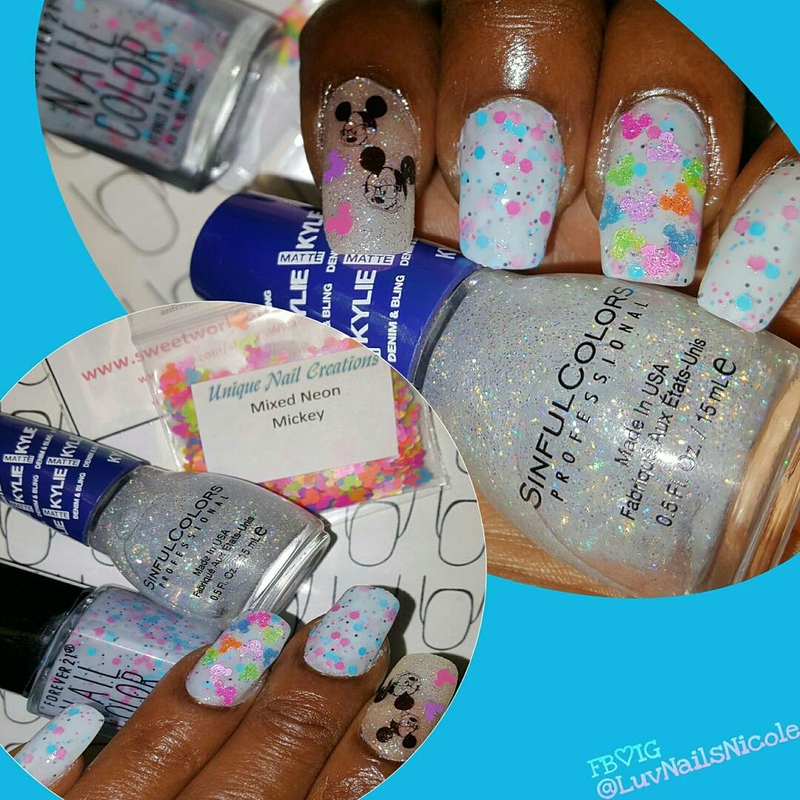 This was my 1st time using WaterSlide Decals.They were sent to me By Sweet World Of Nails. Really easy to use.You Just have to be careful when pulling them off & applying them to the nail.Otherwise they get twisted & ya have to start over like i did twice lol. This design was just something I threw together as I went so it isn’t perfect but I think it turned out cute! Nail Art Mat By ME!